Post-note: Though sources say that this machine didn't introduce anything innovative (and for the most part that's entirely true), I did manage to notice that the escapement release also acts as the paper release depending on which way its pushed/pulled. I thought that was pretty neat. Also of note; Eraser shavings. Eraser shavings everywhere. I hereby swear, by the typewriter engineers of old, to never again take a Blickensderfer apart. For such a simple machine, it sure fought back. In the end, I suppose I made things *sort of* better. At first the mechanism would not move at all, would not shift, and the carriage was half-way to being frozen in place. Now, it can type. Not perfectly, but certainly well enough for a letter to a friend. In what I can only describe as a nightmare to deal with, I foolishly messed with the tuning screws on the machine (of which there are 4 directly related to the ability of the typewheel mechanism to function). As far as I am now aware, you DO need the proper factory manuals to deal with tuning these screws else everything will jam up. Though it shames me to admit it, when I was trying to pry the typewheel off I had also inadvertently broken a small, teeny bit of steel on the central piece of the mechanism. In doing so, I rendered the part un-usable. To fix this issue, I had to sacrifice my currently carriage-less Rem-Blicks own central piece as a substitute. They only made around 9k 9's, and only around 6k Rems, so either way I am most assuredly going to deal with typewriter hell at some point or another for damaging anything related to either of them. Sadness out of the way, here is the Blickensderfer 9 in all its glory. There are still a few small things to tune. I had forgotten to reset the spacing screw before typing, so as I fiddled with it I ended up with some odd line spacing. Alongside such, my O's sometime turn into I's, and the typewheel doesn't always pick up the ink as well as one would hope. I ended up needing to rebuild the typewheel mechanism, and not just once but about 3 separate times to get the bleedin' anchor-gears into their proper spots. In regards to design, its quite simple. But in being simple, its beyond complex to get correct. I highly recommend never taking one apart. One of the most disconcerting fixes I had to make was the need to bend the main ink arm. Somewhere along its travels, I believe someone had smashed it in a wee bit, because it was too "scrunched up" to allow the typewheel to shift at all. I grabbed a small toaster oven and got it hot, then carefully bent it with some wrenches, and all was well. The case is in great shape (though still in need of a good cleaning), and I do believe that once its properly brought up to snuff, I may very well begin taking this lil' blick with me to type on. It's still not the quietest of machines, but by golly it definitely is unique. And finally, if anyone has a parts Blickensderfer 5 that's beyond saving for one reason or another, let me know. I'm hoping a 5's mechanism will work with my Rem. Today, I set about the task of tackling the main typewheel mechanism of the Blickensderfer 9. I finished up the body the other day, and was eager to get this machine back to operational condition as quickly as possible. Beginning with other matters, here are some reference photos for anyone who needs 'em. And here is the actual mechanism, once taken from its shell. It is held in place by two pins, which are in turn held in place by two screws. Very easy to take out, though do be careful of the small spring which connects towards the back. Once I got it to this point (and having taken off the small circular parts with the rods on them - not pictured), the gearing decided to randomly start working again. Huzah! I thought. I won't have to dissect this any further! But alas, I found to my horror that the typewheel would not come off. Nor would it shift. My hopes dashed against the rocks, I liberally applied(AKA completely washed it down) with some liquid wrench, and gave it some time to soak. Due to an unfortunate chain of events which will not be described here, my efforts to get the typewheel off resulted in the utter destruction of said typewheel. Save for the damnable core, which was in every sense of the word fused to the metal pin. I'm now trying to determine how to proceed, having sadly lost the typewheel and still needing to get the (copper?) core off of the pin. The mechanism still refuses to shift as well, and due to the nature of the design, I cannot get the rod out at this point. At the very least, in dealing with so many machines, I'm used to being hit with a brick at every turn. So there's that. Onto the less-sad side! The body, as mentioned, is done save for the upper mechanism. When it comes to my most wanted machines, it truly is hard to properly make out a list (though I did try a few weeks ago). There are just so many awesome and cool designs out there. But of those designs that actually worked, there were two that stood out prominently that I hoped to own: A Blickensderfer, and a Hammond. Due to sheer dumb luck, I now own a Blickensderfer. And on top of being a Blickensderfer, its a model 9. According to Mr. Richard Polt (Via the Classic Typewriter Page), there is an estimate that only roughly 9,000 of these guys were made, so I'm proud to own one. to own this Blick 9. Honestly, the only machine safe from me would be a Sholes and Glidden. The first 6 or so are reference pictures for re-assembly. As a note, I would like to mention that it seems you can never predict what the hell will happen to the rubber feet on typewriters. Look at this! The front, though white, are still in their normal shape where the back have turned into diseased pancakes! What the heck! And thus, the Blickensderfer 9 has been torn asunder. The paints in amazing shape, and most of the exposed nickel is going to clean up nicely (some of it like the type-bar guide is all corroded to hell, though). I already did a How To on the Rem-Blick which is 99% identical, so I probably wont do another series for this one. Unless you guys want one specifically just for the sake of it. As a final note, I would like to mention once more just how ingenious this machine is. Its so small, so well designed, yet so easy to comprehend. I believe that the Blick-Electric would have revolutionized the world of typewriters had it only caught on, and we would have seen 80 extra years of progression in regards to electric utility machines. I really want to see someone with a Postal show it off, and compare it to a Blick. Does the addition of a motor make it easier to use? Does the ribbon get in the way compared to an ink roller? What is the difference in the actual design for the typewheel mechanism? 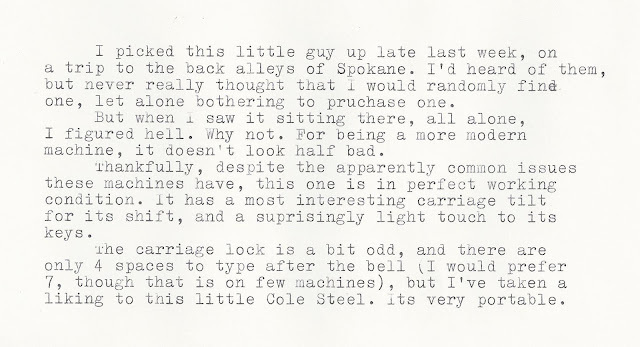 Warning: Contains exposed typewriter mechanisms. Viewer discretion is advised. With multiple machines on the workbench at the moment, I decided it would be an interesting venture to show off a few of them without their decorative body shells. The two main machines I'm cleaning currently, a Remington 5 and a Royal P, are very similar in regards to age, shape, size, and function, yet are so completely different. Where the Remingtons distincive look comes from its flat-fanned typebasket, and its more forward and un-pronounced ribbon spool area., the Royal has the more standard U shape typebasket area with the much larger and noticeable ribbon spool area. Despite the greater amount of metal on the Remington frame, the Royal just feels more solid for some reason. I will mention that for the longest time I could not consider how the Remington self-starter worked. As with all things, it seems, upon inspection its actually incredibly simple and I'm disappointed I could not imagine a solution myself. Basically, pushing the key down pushes a catch out to the escapement rack and activates the release. The catch can only move 5 spaces before hitting a stop. Then, by letting the key go, the catch is pulled back and the escapement rack goes back to normal operating position. The black keys add to the look of the black shell on the Remington, but nothing can beat the style and feel of Royal glass keys. With those two machines considered, I decided to throw in an unexpected contender; Many of you have seen this little design on my blog before. Its the assembly for a Fox portable typewriter. I decided to show just how tiny it is compared to its bigger competition (well, what would have been the competition had Fox not gone bankrupt in '21). I like to think that had Fox survived, the patent issues with Corona would have made them produce a 4 bank portable when they realized that others were doing so. The mechanism of the Fox portable, when transitioned to a 4 bank machine, alongside the outstanding level of care given to aesthetics by the company, would have resulted in one of the most attractive and well engineered machines. Alas that they never had the chance to try. We cant just compare the Fox to a Royal though. No no, we need to bring bitter enemy's together. I had to threaten them both with WD-40 to get them to not fight, but I can still sense the anger simmering. The Fox, of course, had a mechanism that can be taken out of the main shell entirely. The Corona, entirely opposite in design, is actually built into the main shell. Time has not been kind to the Fox portables; more often then not, they are in terrible shape and function poorly. A shame, because they are so well designed. The manufacturers would have probably laughed at us expecting these machines to survive in working condition after 100 years, but oddly enough as we know, some machines can look like rust piles and still work wonderfully (such as the Underwood 5). 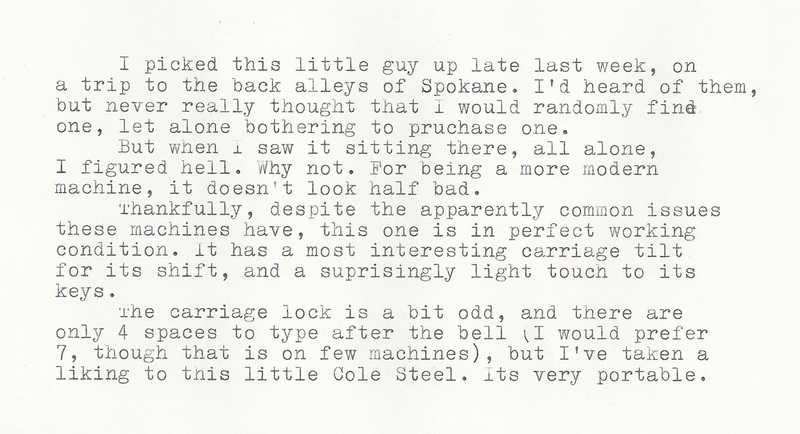 That concludes todays exciting episode of Northwest Typewriters. Tune in next time!